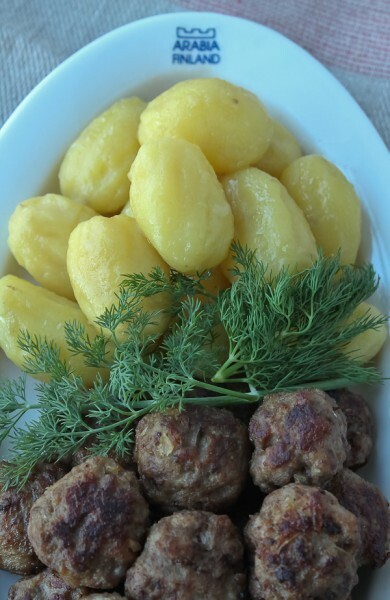 Meatballs and potatoes say comfort food, especially in the winter months. 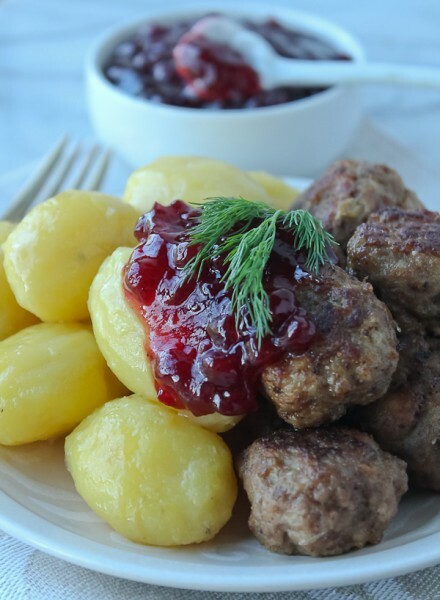 The Nordic way to serve them is with boiled potatoes and lingonberry jam. The combination is delightful, colorful and tastes amazing. The meatballs have hints of nutmeg, ginger, allspice, and cloves. 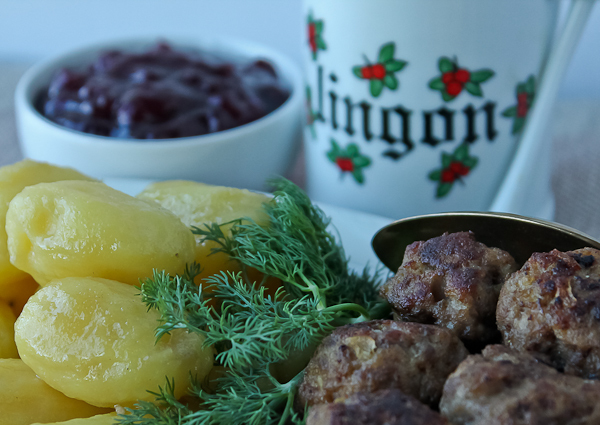 Lingonberry jam is not overly sweet and the potatoes only have a little salt, pepper, and butter, so when all are combined it’s a perfect blend of flavors and textures. Note: *Instead of 1# beef and 1# veal, you can use 2# of the "Meatloaf Mix" that has beef, veal, and pork. In a large bowl combine the beef, veal, and onion; set aside. Pour seltzer water into a medium bowl and stir in bread crumbs to coat; let sit for 5 minutes. Meanwhile, whisk together egg, honey, salt, mustard, nutmeg, ginger, allspice, cloves, and white pepper. Add bread crumb mixture and egg mixture to meat. Using your hands, mix ingredients together until just combined. Form meat into walnut-sized meatballs. At this point, you can cover and chill the meatballs until ready to cook later. Heat the butter in a large skillet over medium heat. Place meatballs in hot pan and saute on all sides until nicely browned and meatballs are cooked through, doing in two batches if your skillet does not hold all the meatballs and using more butter, if needed. Serve with peeled, boiled potatoes* and lingonberry jam. *Note: I like to use the very small red potatoes or Yukon gold potatoes. Boil water and add desired amount of whole small potatoes. Boil for 15-20 minutes or until just done. Drain and let cool slightly. Peel off skin. Toss potatoes in a skillet with a little butter, salt, and pepper to taste until hot. What an interesting combination of spices for a savory dish! Is this recipe from your relatives? Yes, those wonderful spices go into a lot of Scandinavian cooking, both sweet and savory! Delightful comfort food for these cold, wet days.